The Flagler Museum is pleased to present a major exhibition of work by American artist Walter Gay (1856–1937), which has been in development for four years. Impressions of Interiors examines the life and work of an American artist who specialized in painting the sumptuous interiors of wealthy collectors and society figures in late-19th and early-20th-century America and Europe. The exhibition is composed of 69 paintings and works on paper by Walter Gay, as well as a selection of ancillary historical material from 40 public and private collections. The exhibition includes an audio tour, providing interpretative information and perspective on select pieces. The exhibition audio tour was prepared by the Frick Art & Historical Center, Pittsburgh, and is included with Museum admission. American artist Walter Gay (1856–1937) specialized in painting views of opulent residential interiors in late-19th and early-20th-century America and Europe. John Singer Sargent, Gay's contemporary, is well known for painting the sumptuous clothing and jewels of American society in his fashionable portraits. Walter Gay, in contrast, painted society's rooms—with their silk wall coverings, ornate paneling, 18th-century French furniture, tapestries, and sculptures—arranged in the private spaces of what were often legendary residences. 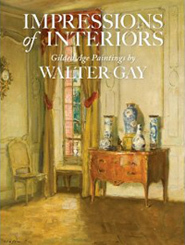 Impressions of Interiors presents a comprehensive exploration of Walter Gay's depictions of elaborately decorated European and American domestic interiors, painted from the mid-1890s to the early 1930s. These paintings serve as documents of the collecting, decorating habits, and taste of Gay and his patrons, and also as mirrors of their attitudes towards the past. As one of the few Gilded Age homes remaining in America with interiors as sumptuous as those Gay represented in his paintings, Whitehall, the magnificent home of Henry and Mary Lily Flagler - now the Flagler Museum - is uniquely suited to host the exhibition. The exhibition features paintings from major private collections and institutions including: the Art Institute of Chicago; Museum of Fine Arts, Boston; Metropolitan Museum of Art; Musée d'Orsay, Paris; and the Smithsonian American Art Museum. Impressions of Interiors: Gilded Age Paintings by Walter Gay is organized by the Frick Art & Historical Center, Pittsburgh. This exhibition is made possible by a generous grant from The Richard C. von Hess Foundation. "Gilded Age Painter Captured Poetry of Rooms"
"... visitors found [the paintings] gorgeous, informative, even inspirational." Walter Gay (American, 1856–1937), Les Tableaux, Le Bréau, c. 1918. Oil on canvas, 17 ½ x 21 in. (44.45 x 53.34 cm). House Collection, Dumbarton Oaks, 34 Les Tableaux, Le Bréau Collection Washington, DC; HC.P.1936.36. In conjunction with the exhibition, the Museum invites fourth through eighth grade children to a special gallery tour with the Museum's Education Director followed by a hands-on learning activity. Tour the exhibition with Impressions of Interiors: Gilded Age Paintings by Walter Gay curator and exhibition Catalogue lead author Dr. Isabel Taube. Dr. Taube will provide an expert perspective and insight on Walter Gay's life and work. She teaches American and European nineteenth- and twentieth-century art history at the School of Visual Arts in New York City and at Rutgers University in New Jersey. She currently is working on a book about the symbolic significance of decorative objects in Gilded Age paintings of interiors. A Catalogue signing will follow the Gallery Talk. The 222-page exhibition Catalogue may be purchased through the Museum Store. Impressions of Interiors accompanies the major traveling exhibition, Impressions of Interiors: Gilded Age Paintings by Walter Gay. Written by scholars including exhibition curator Isabel L. Taube, PhD, an art historian at the School of Visual Arts, New York. Hardcover and paperback versions of the Catalogue can be purchased through the Museum Store. Dr. Taube will sign copies of the Catalogue following the Gallery Tour.